U.S. forces have been instructed to take all measures needed to protect American interests in Syria, including military measures, as part of an effort that comes after top officials in the Trump administration assessed that Iran is deliberately probing American weaknesses and reactions on the Syrian battlefield, according to senior Trump administration officials who spoke to the Washington Free Beacon. Iran-backed forces, including Hezbollah, have already initiated multiple encounters with the United States by violating agreements worked out between Washington and Moscow aimed at preventing the various factions targeting ISIS inside Syria from coming into conflict. This is part of a campaign that analysts inside and outside the White House believe is aimed at testing the Trump administration's resolve, sources said. "That was very clearly a process of the Iranians and Hezbollah and [the] Syrian regime probing and testing our limits, and testing how much we were willing to do," one senior Trump administration official said. "In every case, it was a matter of them testing and probing, and us responding by defending ourselves." 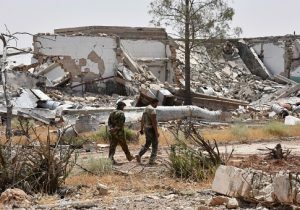 These clashes were the result of pro-Syrian regime forces, including Iran and Hezbollah, "violating a de-confliction measure that had been worked out with the Russians," the official said. "The forces violated the measure." The Trump administration has instructed U.S. forces to respond to Iranian attacks with force if necessary. "What they found out very quickly," said the official, was "us responding by defending ourselves. What was established was that we're determined to defend ourselves." This defensive action is being implemented at the same time the Trump administration turns its attention to the Iranian Revolutionary Guards Corps (IRGC), the Islamic Republic's paramilitary force that coordinates operations in Syria and other warzones. Trump administration officials view the IRGC as being part of "every malignant protrusion of the Iranian regime," according to one administration official, who said the White House is dually focused on choking off this force. The actions by U.S. forces are part of a broader pushback against Iran, ranging from battlefield responses to diplomatic action, according to a veteran Iran policy analyst who has been briefed by the White House both on parts of the Syria strategy and on parts of an ongoing Iran policy review being conducted by the administration. The Free Beacon first reported many details of the review several weeks ago, including actions by the Trump administration to potentially block the sale of U.S. commercial aircraft to Tehran. "For the first time since the U.S. intervened into the Syrian conflict, American forces have been authorized to do take all measures to defend U.S. interests against Iranian provocations and aggression," said the source. "This is part of a concrete strategy that has already been implemented in part, and is being bolstered every day, but very senior Trump officials. No more of watching U.S. forces get rolled in Syria, and also no more of thanking Iran after they seize our sailors in the Gulf. One senior Trump administration official familiar with the Iran policy review said the White House is currently "in the thick of it," evaluating a range of options to confront Iran's global terror operations. The review expands far beyond the landmark nuclear deal, according to the administration officials. "The tack we've taken is not to put the [Iran deal] at the center of the policy," one senior administration official said. "The goals we set out focus on how to neutralize the threat the Iranian regime poses to the US and its allies in the region." U.S. official see the nuclear deal as secondary given Iran's continued terrorist operations and pursuit of illicit arms. This is why the IRGC's activities have become a source of concern in the White House. "You find the IRGC in every malignant protrusion of the Iranian regime," the senior administration official said. "They're in Yemen, Iraq, Syria, Hezbollah in Lebanon," and elsewhere. As the U.S. plots its course with Iran, the Islamic Republic continues to invest in a massive military buildup that many believe has been partially funded by the economic sanctions relief granted under the former Obama administration. Iranian military officials announced on Monday that the country will soon implement its own version of Russia's advanced S-300 missile defense system, which Tehran purchased in a controversial arms deal opposed by many Western nations. "Steady work efforts are being made on Bavar 373 missile system and a number of tests have been carried out on this system, and these tests will continue until the date of delivery," according to Iranian military officials, who predicted the system would be perfected by March of next year. Update: This piece has been edited to clarify U.S. operations against Iran-backed forces in Syria.